SCALABLE from 8 to 1000 channels with no limitation. High measurement dynamics using DUAL CORE 24 bit ADCs up to 160 dB! Sampling rate 200 kS/s each channel (up to 1 MS/s with SIRIUS high-speed). Smart real time counters (synchronous). Customized slices with any channel configuration any input connector. The SIRIUS® line of instruments are built with one purpose in mind – to measure any kind of signal, anywhere, in any environment with precision and ease of use. SIRIUS® systems use DEWESoft Dual Core ADC technology and are capable of 160dB dynamic range. DEWESoft improved the dynamic range by over 25 dB – achieving 20-times less noise. Different SIRIUS® systems can be combined and synchronised together to expand overall channel count of the system. SIRIUS® can be synced and connected with any other DEWESoft instruments as DEWE-43 or KRYPTON thought the ECAT Sync Junction accessory. SIRIUS® comes in many flavours. If you need standalone instrument with built-in display or just USB DAQ device for you laptop SIRIUS® gives you possibilities for any application. 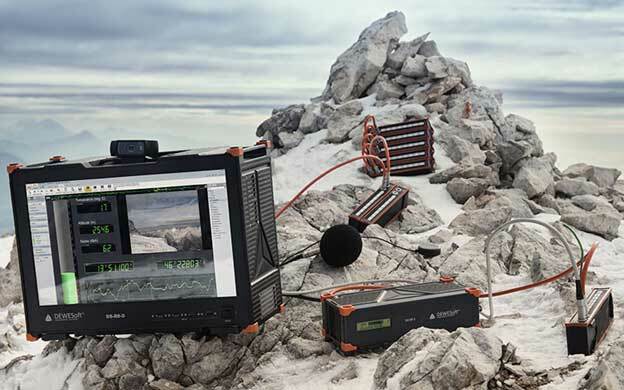 SBOX Powerful and rugged PC option for SIRIUS®. Analog Out Add 8 analog output channels to SIRIUS® slice. Accessories Display, battery, mounting accessories. DSI modules are expanding the functionalities of SIRIUS® amplifiers and can support almost any kind of signal and sensor. Analog: voltage up to ±1000V, accelerometers, charge sensors, strain gauges, load cells, pressure sensors, thermocouples, RTDs, etc. Digital, GPS, ARINC 429, 1553, PCM, Chapter 10, Flexray, CAN, RS232, Ethernet and more… Each amplifier channel is galvanically isolated unless otherwise specified.